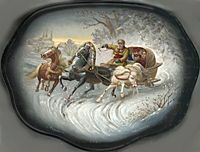 This box shows the traditional theme of a Russian winter troika. The peasants sit in the sledge loaded with hay, and pulled by speeding slender steeds. The troika is painted in bright brown, gray and red oils whereas the surrounding landscape is painted in silver paint that helps to reproduce a shimmer of the snow covered expanses. The box is constructed from paper-mache. The exterior covered with black lacquer, while interior is covered with red lacquer. The work is signed with the artist's name, Fedoskino, and the date of completion being 2013.